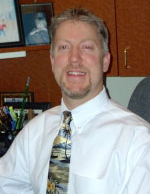 Dr. Arsenault is a 1994 graduate of Palmer College of Chiropractic in Iowa, founded by the father of chiropractic himself, D.D. Palmer. Still amazed at how the body works as a whole, Dr. Arsenault focuses on treating your whole body so it can heal and function as it should. Dr. Arsenault and his wife, Melissa, focus on eating clean and living a healthy lifestyle. They believe in living holistically. Dr. Arsenault and his family do yoga, ski, surf, paddle board, play tennis, hockey and lacrosse. The entire family lives a life of wellness together as a team by staying adjusted, eating well, and staying active. They also stay busy with their adopted rescue dogs. As a family, they regularly support the American Lab Rescue (ALR), and encourage anyone looking for a pet to consider adopting from ALR. Dr. Arsenault enjoys educating, public speaking and hosting stress and safety workshops to various local businesses and groups. He also offers a new patient workshop in his office every other Wednesday. Serving the Seacoast community for over 20 years, Dr. Arsenault welcomes you and your family to experience how focusing on health can enhance your lives. Call our office today.